Back in June, the Centers for Disease Control and Prevention (CDC) issued a public warning that linked a string of eight Salmonella outbreaks to live poultry living in backyard flocks. Now, the agency is providing an update on its outbreak advisory. To date, the CDC says that backyard flocks and exposure to live poultry have contributed to 10 separate multistate outbreaks of Salmonella infections, comprising 961 illnesses, 215 hospitalizations, and one death. In interviews, the agency says that 498 of the 672 people (74%) who became sick reported contact with live poultry in the week leading up to the start of their illness. Many of these consumers said that nothing seemed wrong with the birds at the time, but the CDC says that visible symptoms aren’t necessary for poultry to be carrying Salmonella bacteria. “Contact with live poultry or their environment can make people sick with Salmonella infections. 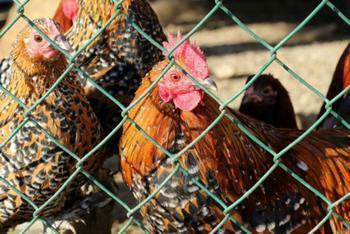 Live poultry can be carrying Salmonella bacteria but appear healthy and clean, with no sign of illness,” the CDC said. To help curb the number of infection cases, the CDC is offering advice to consumers with backyard flocks, mail-order hatcheries, and feed stores that sell or display live poultry. Below you can find a breakdown of that guidance. Not eat or drink near birds or allow them near their face or mouth. Sign up to participate in the U.S. Salmonella Monitored Program, which certifies that flocks are monitored for Salmonella bacteria that may cause illness to consumers. Clean the areas where birds are displayed between shipments of new birds. For more comprehensive information on how to sign up for programs and data on previous outbreaks linked to backyard flocks and poultry, visit the CDC’s site here.